Powerful research-based FIFRA 25(b) liquid botanical oil insecticide that is easy to mix, stays in solution, and is much lower odor compared to earlier generation essential oil insecticides. EcoVia EC is labeled for use and kills of a wide range of flying, crawling and sucking insects such as ants, cockroaches, spiders, fleas, bed bugs, flies, wasps, mosquitoes, ticks, brown marmorated stink bugs, kudzu bugs, white flies, aphids, and many more. EcoVia EC can safely be applied in and around homes, businesses, near and over water such as boat docks and pool areas without harming aquatic life, as well as numerous other areas. EcoVia EC is safe to use around children and pets. NOTE: For indoor use, you can dilute this concentrate in water OR oil. For outdoor use, you can ONLY dilute in water. There is a chart on the label that will tell you the rate according to your needs. "In and around structures, including but not limited to: residential, multi-family, commercial, industrial, municipal, institutional, retail, research, recreational, health care, educational, daycare, hospitality and agricultural buildings and other man-made structures; furniture and bedding (see notice below regarding staining), feed lots, fence lines, garages, greenhouses, sheds, outbuildings, indoor plantscapes, mausoleums, boat houses and boat docks; around and over (thermal or ULV fog only) marshes, waterways, lakes, ponds, stagnant and ornamental water; vent stacks, drains and sewers, urban areas, animal rearing and handling establishments, food service, handling and/or processing establishments, mushroom houses, kennels and zoos. Turf sites include but are not limited to: lawns, trees, bushes and shrubs, landscape beds, ornamental turf, parks, playgrounds, recreational areas, right-of-ways, and golf courses. Transport vehicles, including: trucks, trailers, trains, rail cars, buses, boats, marine vessels and other cargo vessels. " 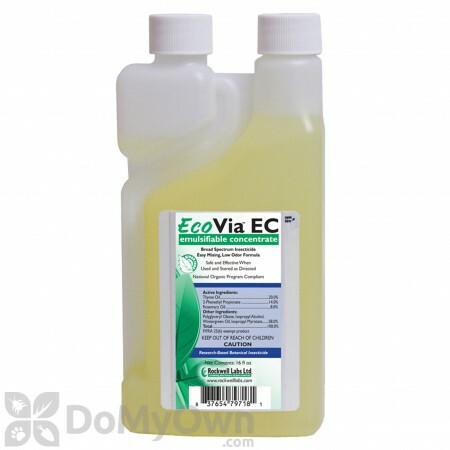 Mix 1-4 oz of EcoVia EC per gallon of water depending upon application site and insect. See product label for specific application instructions. USE SITES: In and around structures, including but not limited to: residential, multi-family, commercial, industrial, municipal, institutional, retail, research, recreational, health care, educational, daycare, hospitality and agricultural buildings and other man-made structures; furniture and bedding (see notice below regarding staining), feed lots, fence lines, garages, greenhouses, sheds, outbuildings, indoor plantscapes, mausoleums, boat houses and boat docks; around and over (thermal or ULV fog only) marshes, waterways, lakes, ponds, stagnant and ornamental water; vent stacks, drains and sewers, urban areas, animal rearing and handling establishments, food service, handling and/or processing establishments, mushroom houses, kennels and zoos. Turf sites include but are not limited to: lawns, trees, bushes and shrubs, landscape beds, ornamental turf, parks, playgrounds, recreational areas, right-of-ways, and golf courses. Transport vehicles, including: trucks, trailers, trains, rail cars, buses, boats, marine vessels and other cargo vessels. Do not use on food or feed commodities, or on food contact surfaces in food handling establishments, unless food contact surfaces are thoroughly washed with soap and water after treatment. MIXING INSTRUCTIONS AND APPLICATION EQUIPMENT: Shake well before using. EcoVia EC should be mixed with water or oil and applied with a handed pressurized compressed air sprayer, backpack sprayer or mist blower, power sprayer, mechanical aerosol misting/fogging equipment, (ULV or thermal), automated spray systems or other conventional application equipment. Clean spray equipment before use. Add approximately half of the required amount of water or oil to the tank and then add the appropriate amount of product, agitate and add the remaining water or oil. Apply the solution until surfaces are wet, but not to the point of run-off. Product requires only light agitation in spray systems after concentrate has been diluted. When diluting with water, prepare only the amount needed for use within 12 hours and maintain light agitation during use. Do not store spray solution overnight. After applications, rinse the tank with clean water, pressurize the tank and flush the valve and hose. FOOD PROCESSING PLANTS, INCLUDING FEDERALLY INSPECTED: All food and food products should be removed or covered during treatment when using product as an area space spray/fog in food processing plants. Do not apply as a space spray/fog while facility is in operation. Cover all food processing surfaces and equipment during treatment or clean with detergent and rinse thoroughly with potable water before facility operations commence. Also cover any sensitive surfaces (plastics, storage containers, vinyl, etc). Close and shut off air conditioning and ventilating equipment. All persons must vacate the treated area. Ventilate treated areas before reoccupying. Food processing operations may continue when this product is applied as a crack and crevice treatment only, with care and in accordance with the directions and precautions provided herein. Treat all accessible cracks and crevices using a compressed air sprayer at the rate of 1 to 2 fluid ounces per gallon directly before fogging for maximum effect. Note: For oil dilutions that are applied in food handling establishments, a deodorized petroleum oil which conforms to CFR 21 (especially section 172.884) is required (such as Exxon Isopar M, Ashland Low Odor Base Solvent or equivalent). Tank mix applications must be made in accordance with the more restrictive of label limitations and precautions. No label dosages may be exceeded. This product cannot be tank mixed with any product with label prohibitions against such mixing. Fogging oils may create slippery conditions on surfaces. Retreat if reinfestation occurs. PERIMETER TREATMENTS AND RECREATIONAL AREAS: Dilute product at the rate of 1 to 8 fluid ounces per gallon or 1 to 8 fluid ounces in sufficient water to treat 1000 sq ft (use lower rate for maintenance service and higher rates for active infestations) and apply until area is thoroughly wet. Apply product to a band of soil and vegetation up to 10 feet wide around and adjacent to buildings. Treat the building foundation to a height of 2 to 3 feet. Make specific efforts to spray areas where pest species congregate such as, but not limited to, landscape timbers, mulch, waste receptacles, dumpsters, downspouts, entry points around water pipes and utility penetrations, windows, shutters, porches and porch lights, doors, vents, overhangs, and eaves. Void applications can be made behind veneers and siding, into stone foundations, into block voids and structural voids, wall voids, under slabs, stoops, porches or to the soil in crawlspaces, and other similar voids. Repeat as necessary. MOUND DRENCH METHOD - FOR CONTROL OF FIRE ANTS AND OTHER MOUNDING ANTS: Dilute 1 to 2 fluid ounces of product per gallon. Apply 1 to 2 gallons directly to each mound until it is wet. In addition apply product in a 4 foot diameter circle around the mound to control foraging workers and newly mated queens. Use the higher volume for mounds larger than 12 inches. For best results, apply early morning or during late evening hours. MOSQUITO AND FLY CONTROL - OUTDOOR YARD OR BARRIER TREATMENT: To control adult mosquitoes and other flying insects, dilute product at the rate of 1 to 4 fluid ounces per gallon or 1 to 4 fluid ounces in sufficient water to treat 1000 sq ft (use lower rate for maintenance service and higher rates for active infestations) and apply until area is thoroughly wet. Treat sites such as trees, shrubbery and other vegetation where mosquitoes or flies may rest, harbor, or breed. Treat any low areas where water has a tendency to to pool. Trees, shrubs, and vegetation around stagnant pools, marshy areas, ponds, shorelines and other areas that collect water may be treated. For best results thoroughly treat the underside of leaves and vegetation, where mosquitoes are most likely to harbor. Repeat as necessary. FOGGING: For ULV (cold fog) and thermal fog applications, apply undiluted or dilute with light mineral oil or another suitable non-phytotoxic diluent. Use up to 0.25-1.5 fl oz of product per 1000 sq ft of ground surface area, or up to 10-60 fl oz per acre. Use higher rates for heavy vegetation and/or when target insect populations are high. For best results, apply when insects are most active and when conditions are conducive to keeping the fog close to the ground. MOSQUITO CONTROL AND OTHER BITING INSECTS - AUTOMATIC SPRAYING SYSTEMS: To control house flies, horn flies, stable flies, horse flies, mosquitoes and gnats, dilute product concentrate immediately before use at 0.25 to 1.5 ounces per gallon of water (Use lower dilution rates for preventative and maintenance applications). Agitate while adding water and maintain light agitation while system is in use. In automatic spraying or misting systems used for mosquito and fly control, solutions of product may be stored for up to one month, as long as the system has adequate agitation. To dispense diluted concentrate through an automatic spraying system, adjust spray nozzles to deliver 1 ounce of liquid per minute at a maximum of 2,000 cubic feet of space per nozzle. Automatic spraying systems must not be programmed to release pesticides where food or feed is directly exposed. STINGING INSECTS: Dilute product at the rate of 2 to 4 fluid ounces per gallon or 2 to 4 fluid ounces in sufficient water to treat 1000 sq ft (use lower rate for maintenance service and higher rates for active infestations) and apply until area is thoroughly wet. Treat nest, nest entrances, harborage sites, and areas where stinging insects, land, walk, or rest. Applicators should wear protective equipment if applications are made when stinging insects are active. For best results, apply early morning or during late evening hours. USE ON LAWNS, TURF GRASS, AND TURF: Dilute product at the rate of 1 to 6 fluid ounces per gallon or 1 to 6 fluid ounces in sufficient water to treat 1000 sq ft (use lower rate for maintenance service and higher rates for active infestations) and apply until area is thoroughly wet. Exceeding rates may result in phytotoxicity of treated plants. USE ON ORNAMENTAL TREES AND SHRUBS: Dilute product at the rate of 1 to 2 fluid ounces per gallon or 1 to 2 fluid ounces in sufficient water to treat 1000 sq ft (use lower rate for maintenance service and higher rates for active infestations) and apply until foliage is thoroughly wet. Exceeding rate may result in phytotoxicity of treated plants. A small-scale test is recommended to verify safety to ornamental plants. While phytotoxicity testing has been carried out on ornamental plants under various environmental conditions, and no phytotoxicity has been observed, certain cultivars may be sensitive to the final solution. Not for use on animals to be slaughtered for food. Livestock Spray for breeding stock and recreational animals (Cattle, Swine, Horses, Goats and Sheep) Ticks and Lice, Flies, House Flies, Deer Flies, Stable Flies and aids in the control of Face Flies 0.5- 1.5 oz per gal of mineral oil USP Dilute in mineral oil USP as indicated and spray directly on the animal in sufficient amounts for proper coverage. Livestock Spray (Dairy Cattle and Goats) Ticks and Lice, Flies, House Flies, Deer Flies, Stable Flies and aids in the control of Face Flies 0.5- 1.5 oz per gal of mineral oil USP Dilute in mineral oil USP as indicated. Direct spray to cover thoroughly. Repeat as necessary. No milk discard is required. Care should be taken that the spray does not come in direct contact with the lactating animal’s teats unless they are washed with an approved cleansing solution and dried before milking. Apply the spray at least 20 min. prior to milking or after milking has been complete. Poultry – Layers and Breeding Stock Poultry Lice, Bed Bugs, Bat Bugs and Mites 1.0- 2.0 oz per gal of mineral oil USP Spray roosts, roost poles, walls (especially cracks in walls), and nests or cages thoroughly. It is not necessary to remove poultry from the housing unit during treatment. This should be followed by spraying over the birds with a fine mist. Residual Surface Spray Flies, Gnats, Litter Beetles, Darkling Beetles (lesser meal worms) Mosquitoes, Spiders, Wasps 2 to 3 ounces per gal of water or mineral oil USP Apply 1 gallon of solution per 500 - 1000 sq. ft. Thoroughly cover walls, ceilings or other areas where pests rest or congregate in dairy barns, horse barns, poultry houses, swine buildings, livestock sheds, and other farm buildings. Larvacide Maggots (fly larvae) 2 to 4 ounces per gal of water or mineral oil USP Apply 1 gallon of solution per 100 sq. ft. of droppings as a coarse spray. Repeat at 7 - 10 day intervals until droppings begin to cone up, then treat only “hot spots” (small areas found to have large number of maggots). EcoVia offers an eco-friendly alternative to synthetics. The main advantage over Essentria is less clogging of the nozzles. However, I've found the main competitor to be slightly more effective in controlling the target pest for longer periods. The odor dissipates quickly when used for exterior purposes. And, if your client is properly informed, they should expect an essential oil type odor during the application. Only has a 2 week residual and I had to re-apply every 2 weeks for my customer. Not near as effective as bifienthrin. Oil based and ruined my rubber gaskets in my Stihl sr 450. Chemical tank and hose had a thick oil coating on it and took me hours to clean. Bought 2 bottles and will be sending the unopened one back. I bought this product to see if I could control the spiders on my boat dock. It is the only product that I have found that is harmless to aquatic life and that I can apply with a pump up sprayer. I first used a Quickie spider cobweb brush to remove all the webs that I could see, and then sprayed the boat dock with the EcoVia. I didn’t spray the decking nor any of the structure above about 8 feet. Spiders were controlled quite well for three weeks, but I needed to spray again before four weeks had passed. I’m highly satisfied with those results. A few minutes each week to brush any webs, and few minutes every third week to spray is well worth it to not be overran with spiders. I bought the small bottle for $17, and it should last me about four months at the frequency I’m using it. This is the first time in 35 years that I have a way to control the spiders with very little effort, and with a non-toxic product. I highly recommend this product combined with weekly use of a web brush. This product worked very well on our infestation of midges. Even pest control could not get them under control. We live on a lake with a sea wall and they hatch every day. We had so many you couldn't walk out in the yard. I like this product because it is safe to use around pets and it does the job. Eco Via is easy on the environment and somewhat easy on the insects. We had to apply 3 times before we saw results with mosquitoes. Eco Via did not discourage the horse flies but after 3 applications at least the mosquito population was diminished. What is the residual treatment duration for EcoVia EC? I like the 'Green' aspect; however, I'm a little skeptical on the effectiveness. What are the recommended intervals for retreating foundations? EcoVia EC has a 3-4 week residual per the manufacturer. 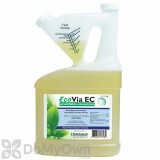 Does the EcoVia EC have an odor and does it dry clear? The EcoVia EC has a light wintergreen scent that will dissipate after applied and dries clear. Does EcoVia EC hurt honey bees? EcoVia EC can be toxic to honey bees that may come in contact with it. Does EcoVia EC offer a residual effect when applied outside? I want to use this product as a spider barrier around the outside of my home. It will obviously be subjected to rain, sun, etc. How long will it provide an effective barrier? Per the manufacturer, EcoVia EC has a 4 week residual. EC products do not have the same length residuals as synthetic insecticides. How would I apply this to closets and around home? Is there a spayer that comes with it? EcoVia is diluted with water according to label instructions and applied with a pump sprayer such as Chapin 1 gallon sprayer. You want to focus on cracks and crevices and can be applied indoors and out.